Now, thanks in large part to the support of programs run by the Farmer Veteran Coalition – a nationwide organization dedicated to helping returning veterans transition into careers in agriculture — Zamora and his wife, Aubrianne, are beginning farmers. For the past 18 months, the couple have operated Zamora Flora, one of 986 officially veteran-operated farms and ranches in California. They currently grow specialty flowers that are well-adapted to the state’s Mediterranean climate on a quarter-acre leased from the Center for Land Based Learning near Winters, about 30 miles west of Sacramento, but have dreams for moving into growing crops to feed people in the not-too-distant future. Zamora Flora also is one of nearly 1,400 veteran-operated farms nationwide – 63 in California – that participate in the Coalition’s Homegrown by Heroes program, a voluntary marketing label for farmer veterans funded in part by Farm Credit associations around the nation. Farm Credit and the Farmer Veteran Coalition are hosting an event in Washington, D.C., on July 11 to thank lawmakers for their support of initiatives to help returning veterans forge careers in agriculture. Gary Matteson, the chair of the Farmer Veteran Coalition and vice president in charge of Farm Credit’s Young, Beginning and Small Farmer Program, said the Senate this month overwhelmingly approved a Farm Bill that added farmer veterans to the list of farmers who have preferential access to U.S. Department of Agriculture loan programs. The bill will need to be reconciled with a different measure passed earlier this year by the House of Representatives. Matteson noted that more than 44 percent of U.S. service personnel are from small towns and rural areas of the country and many returning veterans are interested in farming. The Coalition is the only organization focusing exclusively on assisting farmer veterans, and he said the strong financial support of Farm Credit over the years has made a big difference. “Thanks to Farm Credit’s support, there is no charge for participating in the Homegrown by Heroes program for the farmer veteran, and there’s no membership fee to belong to the Farmer Veteran Coalition,” he said. “In all, Farm Credit has contributed $1 million to the Homegrown by Heroes program since 2012. Zamora said the Farmer Veteran Coalition and the Homegrown by Heroes program have both been extremely important in getting Zamora Flora up and running. They attended an informational session and learned he could apply for a Farmer Veteran Coalition scholarship, which made it possible for both to attend and get a lot more out of the program than if just one of them had gone through it. During the program, which ran through September, they learned about such topics as crop production, business planning, and marketing, culminating in helping them develop a business plan. In February 2017, Zamora Flora was officially born. Meanwhile, the Coalition’s programs continue providing invaluable assistance. This year, the Coalition awarded the Zamoras with a fellowship that provided $3,000 worth of hand tools and supplies. 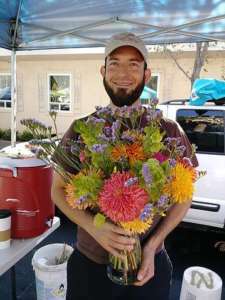 And Zamora said because much of their sales are in farmers markets – along with hosting you-pick flower events every Sunday at the farm – having the Homegrown by Heroes logo prominently displayed on their booth generates lots of potential customers. While the couple’s goal is to move into food production, he said the floral business is giving them a sound foundation in farming techniques and allows them to experiment with different crops, such as sorghum and millet, which they use in their arrangements. Flowers also required less up-front investment, with no need for food safety plans and other requirements. “We want to feed people. We know flowers doesn’t let us do that, but it’s a big step in the right direction. We want to expand and get into food, maybe expanding into chickens, eggs and even lamb,” he said. With the continued support of the Farmer Veteran Coalition and institutions like Farm Credit, this Marine-turned-farmer and his wife have more than a fighting chance of success.